“No!” the group responded in unison. “Shower!” a few called out. This might sound like a typical lesson in the age of anything-goes office wear, but these millennials aren’t so typical. 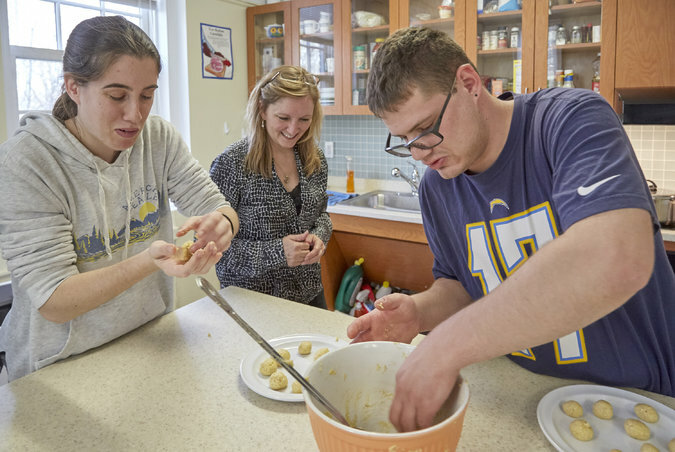 Ms. Muscatello and her peers belong to a pioneering group of students with significant intellectual disabilities who are enrolled in Syracuse’s InclusiveU. 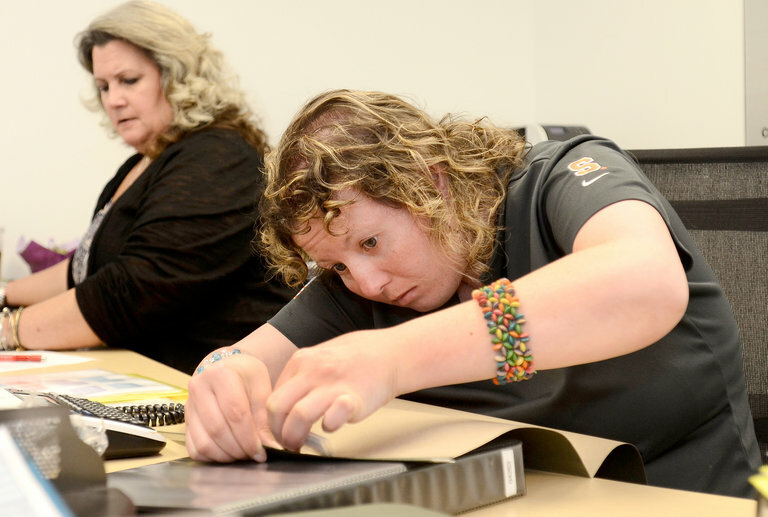 The students — about 60 are expected this fall — have various degrees of disability, often with related developmental disorders. One communicates through a picture board and an iPad; a helper supports her arm as she taps out words. Another, a movie buff who wrote a play for his theater class, has Asperger’s syndrome. A sports enthusiast who interned this past spring with the Syracuse Orange men’s basketball team has Down syndrome. During the first three years, the students choose “majors” and audit five to six college classes that align with their interests. They complete homework and take tests, ungraded, with the help of note takers, who are supplied by the university to sit with them in class. Popular majors: disability studies, sport management and food studies. Favorite classes: first aid, “Animals and Society” and “Peoples and Cultures of the World.” The students also take a spattering of electives, like hip-hop dance, jewelry-making and photography. For their fourth year, they intern on campus. All the while, they attend workshops — on email etiquette, workplace chitchat and résumé writing — and spend time with student volunteers at trampoline parks, basketball games and pizza parlors. The goal: to become employable. Fifty years ago, young people with intellectual disabilities were often institutionalized or kept home, out of the public eye. Thanks to 1975 legislation now called the Individuals With Disabilities Education Act, more than 90 percent of them now go to public schools with mainstream students. 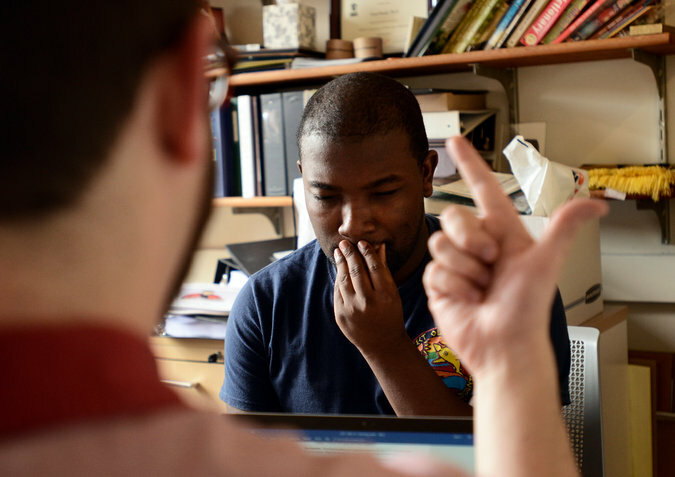 Today, there are some 265 work-readiness college programs for students like the ones at InclusiveU, according to Think College, a federally funded coordinating center at the University of Massachusetts, Boston. That’s a big leap from 2004, when there were just 25. Unlike programs for high-functioning students on the autism spectrum, these award certificates, not degrees. What the students want upon graduation are good jobs, not short-term gigs restocking shelves or handing out fliers on street corners but employment that relates to their interests and plays to their strengths. Therapists, economists and philosophers have long equated happy, fulfilling lives with meaningful work, no matter one’s intellectual ability. But the same survey found that only 40 percent of students exiting programs in 2015 were in paid jobs within 90 days of leaving. That’s a lot better than the 7 percent employment rate for similarly disabled adults within the general population, as reported in a 2011 study. But it’s still a dispiriting number. To improve outcomes, the university overhauled the program in 2014, rebranding it as InclusiveU. And with a $2 million federal grant, Ms. Shults was hired to design the internship year and workshop curriculum, which replaced a fourth year that had been purely academic. The first class will graduate in 2019, but already Cate Weir, Think College’s program director, cites InclusiveU as a model. The conversations led Kaitlyn O’Reilly, who was born with a rare chromosome abnormality, to take a disability studies class popular among sociology majors. Her end-of-semester assignment was an evaluation of campus crosswalks unfriendly to visually impaired students. She and her note taker had created a map showing where to put raised street markings and audio boxes. The room was silent as Ms. O’Reilly, who has a speech impairment that can make it difficult to understand her, stood next to a podium and went through the locations on the map, displayed on a whiteboard. “These ones are good, these ones are bad and these ones are half not O.K., half good,” she said, pointing at green, yellow and red dots on the map — a color-coded grading scale. Ms. O’Reilly, who is in her first year in the program, said the presentation had given her a sense of her own power. “I felt very proud of myself,” she told me. Ms. Shults sees her getting an internship at one of the campus’s disability centers. Ms. O’Reilly says she thinks she’d like to work with children. With an I.Q. around 65, she finds simple things like work manuals and basic textbooks challenging. Big words confuse her, and her math skills don’t go past third grade. But she is funny and warm, with an easy smile. She likes Harry Potter books, natural disaster movies and her cat. And “I love it here,” she said of the campus. When mayonnaise jars broke or one-pound bags of flour cracked open, it was Ms. Muscatello who was asked to do the cleanup. “I’d go home all covered in flour,” she said. “You could stick me in the oven and bake me like a cake.” She would cut her hands when cleaning up glass. Her mother, a labor and delivery nurse, wanted more-challenging work for her daughter and more respect. “I wanted more of a people job for her.” Ms. Muscatello did, too. This past year, she participated in three campus internships. In the fall, she interned in the repair shop. The first few days, the program’s job coach shadowed her as she learned how to fill out work order forms when complaints came in that light switches or elevators weren’t working. Once on her own, Ms. Muscatello found the work manageable but boring. For her second job, she worked in the day care center reading to preschoolers, helping them with yoga poses and, once, calming them when a raccoon got stuck in the playground. But she found the work exhausting. When an officemate teased her that the boxes she was delivering might be too heavy for her, she insisted: “I’m capable of carrying some of the heavy boxes.” She does not want to be underestimated. Touring classrooms, computer labs and a coffee house where students hold meetings, talent nights and parties, parents talked about their dreams and concerns. A New Jersey mother of an 18-year-old with a developmental disability thought the time away from home would be good. “For him, not me,” she said woefully. Some take issue with the programs for supporting what they consider an impractical but prevalent idea — that everyone should go to college — and giving students a false sense of academic accomplishment while costing taxpayers and parents. Instead, they believe these students ought to be funneled into more cost-effective and targeted vocational training programs and apprenticeships. “If we are going to really help people with significant disabilities, it’s not by pretending they can go to college and do college work,” said James M. Kauffman, a professor emeritus of education at the University of Virginia who has written extensively on special education. Ms. Weir of Think College says such thinking too narrowly defines how a college education benefits students, ignoring much of the socio-emotional learning that happens for those in their late teens and 20s — with disabilities and without — while clocking time on a campus. Further, she says, just because students don’t get 100 percent of what is taught in a class does not mean they haven’t benefited. Advocates say that the biggest issue isn’t so much with the programs as with the work force. Many employers worry about the expense and training required when hiring someone with a disability. And low-skilled jobs that might have once been appropriate for this population are disappearing in our increasingly tech-centered economy. Ms. Muscatello’s journey illustrates how hard that can be. An administrative assistant sat by her side, giving her the day’s assignment: to empty black binders that had been used for a recent conference, remove the tabs, and place them in a box on the floor. Ms. Muscatello also worked the phones. But when she picked up a call for someone in the entrepreneurship office, she got confused and couldn’t say the word. Another time, pressing the buttons gave her trouble. Her supervisor had told her that if she got better with the phones, there was a good chance they’d hire her. When Ms. McPheeters got wind of this, she sent Ms. Muscatello home to practice with a photocopy of a telephone with the numbers pad on it and her cheat sheet. She spent days on it, after work and on weekends, announcing: “Hi, I.V.M.F. This is Meghan. Can I help you?” She tapped on the paper numbers with her index finger, as if she were transferring the calls. But when the semester ended, the supervisor said that funding had been cut and they were not going to be able to hire Ms. Muscatello. “I was a little bit disappointed,” she told me. A few weeks later, in a cap-and-gown ceremony at a chapel on the main quad, this year’s graduates received their certificates. One now has a job doing clerical work in a municipal office. Another has a position as a shop technician at a carpet cleaning company. As for Ms. Muscatello, she spent weeks eagerly waiting, her résumé, letter of recommendation and interview outfits, free of cat hair, ready to go. Then one morning she was called in for an interview — and aced it. This month she is expected to begin working the front desk at a YMCA. She got her dream job. An article on Page 16 this weekend about students with developmental disabilities in special college programs refers incorrectly to a legislative act passed in 1975 that opened the way for such students to attend mainstream classes. When it became law, it was the Education for All Handicapped Children Act (and was later reauthorized as the Individuals with Disabilities Education Act); it was not known as the Individuals With Disabilities Act in 1975 or at any other time. Kyle Spencer writes frequently for The Times on education.